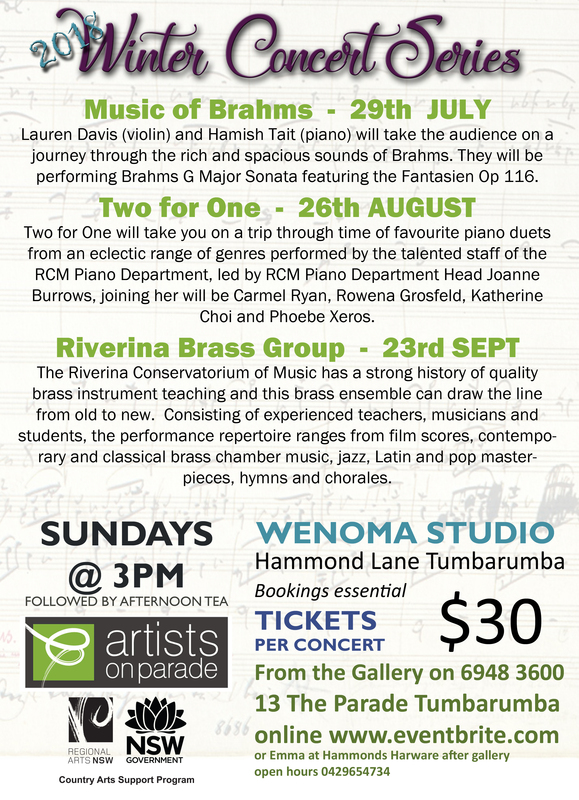 Lauren Davis (violin) and Hamish Tait (piano) will take the audience on a journey through the rich and spacious sounds of Brahms. They will be performing Brahms G Major Sonata featuring the Fantasien Op 116. Two for One will take you on a trip through time of favourite piano duets from an eclectic range of genres performed by the talented staff of the RCM Piano Department, led by RCM Piano Department Head Joanne Burrows, joining her will be Carmel Ryan, Rowena Grosfeld, Katherine Choi and Phoebe Xeros. 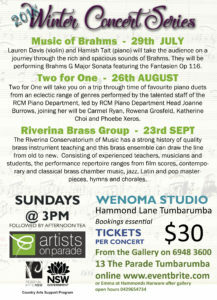 The Riverina Conservatorium of Music has a strong history of quality brass instrument teaching and this brass ensemble can draw the line from old to new. Consisting of experienced teachers, musicians and students, the performance repertoire ranges from film scores, contemporary and classical brass chamber music, jazz, Latin and pop masterpieces, hymns and chorales.